The jsMath module is now a filter. By default, the filter detects all the delimiters as defined by the jsMath library. This includes \( ... \), \[ ... \], $$ ... $$, $ ... $. It also supports the tag like syntax with [math], [/math] and [display], [/display]. The [math] tag, parenthesis and single dollar sign generate an inline math equation. This means the result is saved in a <span> tag. The [display] tag, square brackets and double dollar sign generate a block with the math equation. 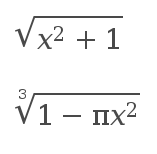 By default, that block is centered which is the default way of presenting equations. This means the result is saved in a <div> tag. The double dollar sign delimiter can be changed to generate inline math equations. What is written between the tags is the usual TeX math equation. Very practical if you are writing a lot of mathematical equations!